UFW Stories: "Reflections of a Union Organizer: Watsonville, California"
"Reflections of a Union Organizer: Watsonville, California"
Forty four years ago, I made the decision to get involved in social justice issues. It has been a long road with many ups and downs, but deep in my heart, looking back, I am proud to say I have no regrets. As I push towards 60 years of age, the memories of being a labor organizer for the United Farm Workers of America remain vivid and inspiring. I hope my contribution to this volume helps to tell the story of what it was like to have worked with Cesar Chavez, Dolores Huerta, Pete Velasco, Andy Imutan, Maria Elena Serna, Roberto Garcia and all of the other people who were part of the farm worker’s movement. The first time I heard the name Cesar Chavez was at a MAYO (Mexican American Youth Organization) meeting in Uvalde, Texas in 1968. I was in high school at the time, and we would have weekly meetings in an old two story house on Nicholas Street to discuss the Chicano Movement and what we were going to do to make things different for “el Mexicano” in Uvalde. I really didn’t say much in these meetings, because I barely knew what was going on. I wasn’t well educated and my vocabulary was limited, but I do remember the older guys in the MAYO meetings telling us about this man named Chavez who was working to get farm workers better pay. In the 1960s, I worked during the summers in the agricultural fields in Uvalde and the surrounding area. Mr. Morales, a local labor contractor would send his trucks around the barrio and pick up people to go work in Pearsall in the pepino or Batesville in the melon. When I jumped on the truck, it never occurred to me that I might ask to be paid more money. I, like everybody else just accepted what they paid us. The idea of us having rights never crossed my mind. In 1969, I went up North with friends to work in the sugar beet fields. We worked hoeing sugar beets for $15 an acre. An acre was a long row of sugar beets. I had never seen rows that long in all my life. On the weekends, we would go to town to the movies or to a dance. It was in Minnesota where I first saw the black eagle of the farm worker’s movement. We had passed by a grocery store and there were people outside with signs. It wouldn’t be until later that I would come to find out that they were boycotting grapes. After the sugar beet work was over, we moved on to Wisconsin to work at a Del Monte cannery. There was one man, whose name I’ve since forgotten, who lived in the barracks with us who seemed to know a lot about what was going on with the farm workers in California. He was the one who told us more about Cesar Chavez. As we came to know more, my friends and I were surprised that the farm workers were standing up for their rights. In the summer of 1970, I found myself picking tomatoes in Stockton, California. I would catch the labor contractor busses that would pick up people at 5:00am on Hazelton Street near downtown Stockton. Sometimes, there would be 20 or 30 busses lined up four abreast with headlights beaming as hundreds of farm workers quickly checked to see which was bus was going to which crop. One day, as I was picking in the hot sun my thoughts turned to the direction my life had taken. I had dropped out of high school when I was 16. I was a migrant farm worker moving from state to state. I lived day to day and owned nothing. Now here I was bent over in the fields in California with no plan of where I would be next week or next month. I said to myself, I have to do something to change my life. One day I heard on the radio that one could go to college as long as they were 18 years of age (Back then we carried little radios with earplugs that we listened to as we picked). I remember hearing that radio commercial about 10 times that day. I had just turned 18 that May. A letter from home informed me that a friend of mine from Uvalde, Sara Montoya, was living in Stockton and enrolled at the local community college. I made contact with her and she invited me to come to the school and visit. The day I went she took me around, showed me the campus and introduced me to some of the people who were members of MECHA (Movimiento Estudiantil Chicanos de Aztlan). Then she excused herself because she had to go to class. I stayed behind and told the guys from MECHA that I had come from Texas and that I really wanted to go to school. We talked for a little while and one of them, Richard Pineda, personally took me to the registrar’s office to see if I could enroll. They told me that I could only attend night school since I would be registering very late. I filled out the paper work and was sent down a hall to have my photo taken. No one asked me about a high school diploma. No one asked me about SAT or ACT test scores and of course I didn’t bring the issue up. So with that I was now a student at San Joaquin Delta College. Back then, community college was basically free. One only had to pay for books. Although I only had classes at night, I would go to campus during the day to attend the MECHA meetings. It was at one of these meetings that I first saw Maria Elena Serna. Someone pointed her out to me and said, “There goes Cesar Chavez’s representative.” When I looked up she had two or three people in tow, a red bandana wrapped around her head, several farm worker buttons pinned to her shirt and she was moving at a quick pace. It wasn’t until about a week or two later that I finally introduced myself and told her that I wanted to get involved. In a short time I was following her to meetings and doing picket line duty in front of Safeway Stores in Stockton. I went with her when she gave speeches at churches, to community groups and visited migrant camps in the area. I was very impressed with Maria Elena. She knew a lot and spoke with great confidence. Much later I would find out that she came from a big family in Lodi, California and that all the members of her family were big time Cesar Chavez supporters. Maria Elena Serna was the one who “organized” me. The United Farm Workers Organizing Committee, as it was called back then, opened an office in Stockton in the fall. Andy Imutan and his wife were sent to staff the office and Maria Elena introduced me to them. I had a lot of time on my hands and so I would spend much of that time at the office as a volunteer. It was there that met a man named Hy Balin. I believe he was from New York and I believe he was union organizer with taxicabs. I spent hours listening to him tell labor movement stories as we walked the picket line in front of the Safeway Stores. In 1971, I went to United Farm Workers rally at the Civic Center in downtown Stockton. (This was the building across from city hall and the public library.) Inside, the place was packed and it was loud. This was the first time I ever saw Cesar Chavez in person. He was wearing a white guayabera and when he came into the building he walked down the center of the aisle. I was very excited to be there. The Chicano Movement was in full swing in Stockton at the time and I would say the United Farm Workers had a lot of support there. Richard Lopez, a popular community activist was big time supporter of Cesar and the union and of course Dolores Huerta was from Stockton. (I did not know that at the time.) Like a lot of folks back then, I did not develop a great appreciation for Dolores or her contributions to the union because I did not know much about her. In early 1972, Andy Imutan and his wife had moved on and Pete Velasco was assigned to head up the Stockton office of UFWOC. As I later found out, Pete was one of the originals who had started with Cesar in Delano. He was the one who educated me about the history of the Filipino farm workers. Growing up in Texas, I had never heard this story before. I had no idea of the Filipino farm worker’s struggle when they came to America. One day a group of farm workers came to the office. They were mad and told Pete that they had been working in the tomatoes where they were told they were going to receive a certain amount per bucket and now they were being paid less than promised. They wanted action. Pete listened to their complaints and did some investigating. Two days later I found myself participating in my first farm worker labor strike with Maria Elena and Pete Velasco. In the two years I worked as a volunteer in Stockton, I met a lot of people from the churches and unions. I also learned how to play the guitar and learned some of the union songs. This was also the year that the United Farm Workers Organizing Committee became the United Farm Workers Union of America AFL-CIO. In June of 1972, with the help of a lot of extra classes and tutoring from the Gamez sisters, I was able to graduate from Delta College. When the letter from UC Berkeley arrived stating that I been accepted for the fall quarter, I was both surprised and relieved. Berkeley was not my first choice. I wanted to go to Sacramento State University where many of my friends had been accepted. The only problem was, the registrar was classifying me as an out of state student and that meant I would have to pay out of state tuition. I argued that I was now a California resident, but to no avail. So when Berkeley offered me a spot, the issue of being from Texas never came up, y pos yo no dije nada tampoco. In September I moved into the Casa Joaquin Murrieta Chicano Coop. This was an old three story house one block from campus where about 25 students lived. The rent was cheaper than the dorms because the students did many of the chores to keep costs down. I soon found out there was a United Farm Worker Support Committee at Berkeley and this was the group I worked with for two years. Almost every Saturday we were doing picket line duty at some store. (Mostly Safeway stores) We had meetings on campus and were always looking for more volunteers. One thing about Berkeley back then, students were eager to be a part of the farm worker movement. I recall that in the Spring of 1973, we organized a big event and brought Pete Velasco over to be the guest speaker. I was very happy to see him again. It was also during the spring of 1973 when the union went to war with the Teamsters. The contracts that the UFW had won in 1970 had expired and the grape growers turned around and signed sweetheart contracts with the Teamsters. The union called its members out on strike and from April until early August, there were strikes all up and down the state. As part of our farm worker support committee activity at Berkeley, we collected food and made regular runs to Lamont and Arivn, California. A friend of mine named Eddie Razo (Sugar Bear) usually made the trip with me. In August, the violence from the strikes was escalating and two farm workers had been killed. Cesar decided to stop the strikes and began making preparations to crank up the boycott again. I had been named house manager of Casa Joaquin Murrieta, and don’t recall how I found out but there was a request was for temporary housing for about 50 Gallo farm workers who were coming to the bay area to begin boycott activities. Since there were no students at the Coop yet, we put them up for about 10 days until other housing arrangements could be made. Throughout the rest of 1973, boycott operations around the country were in full swing. In June of 1974, my time at Berkeley was over. I had graduated with a degree in economics. During the years of the Chicano Movement there was this belief that it was important to return to the community and give back in some way the expertise, insight, and knowledge that one had acquired at the university. I did go back to Uvalde, Texas in late June and after about two weeks, realized that I really had nothing to offer. I was still too inexperienced and as we say in Spanish, todavia bien pollo, so I came back to California. I had an internship lined up with a group called the Central Coastal Counties Development Corporation in Aptos, California. It was suppose to start on July 15th. When I showed up, they told me that it had been postponed until September. Now here I was with a big hole in my summer plans. Then I remembered I had a friend who was working for the UFW in Salinas. I have now forgotten Roberto’s last name but he was a law student at Berkeley when I was there. He had told me he was going to be in Salinas for the summer so I went to look for him at the UFW office. I found him and he introduced me to the director of the Salinas Field Office, a big guy named Roberto Garcia. I told him that I was interested in coming to work for the union. As he interviewed me, he never took off his sunglasses. We spoke in Spanish, English and pachuco and I found out Roberto was actually from Texas. After about a half an hour he said, “Orale loco, you’re in. 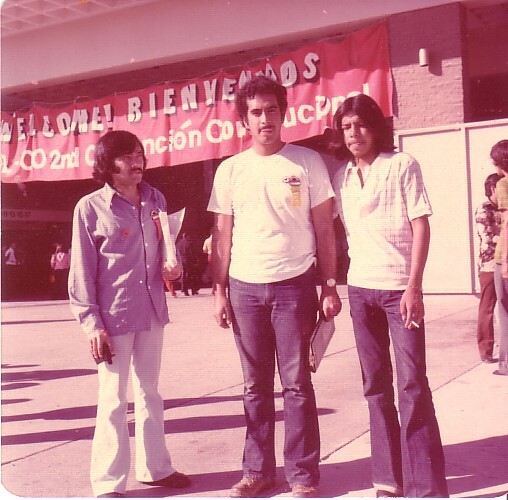 Te reportes manaña en Watsonville, California.” My first day on the job was July 20, 1974. I was going back to work in the fields but this time as labor organizer and I was going to make even less than I did as a farm worker when I was a teenager. How about that for one of life’s biggest ironies? My first day working for the union had me putting in an 18 hour day. We had just won a new strawberry contract with a company called Pik’d Rite and the new members were coming in that evening to pick up their new identification cards. What I didn’t know is that I would be doing the typing of more than 100 of these cards that were being stamped with a machine that had been brought in. There were two other staffers who I was working with in Watsonville. One was Carlos Ruiz and the other was Jose Perez. Carlos was from Mexico City and Jose, I don’t remember where Jose was from but he had just come back from the boycott back East. We quickly became friends and spent the month of August getting to know the layout of Watsonville and the surrounding area. What I discovered was that there were a lot of labor camps in the area. Some had 500 or more people living in them. I also discovered that a lot of the farm workers were from Gomez Farias Michoacan, Mexico and their last names were either, Fernandez, Rocha or Zamora. During my second week in Watsonville, Carlos told me there was a group called the Watsonville Organizing Committee. They were long time supporters of the union and a number of them were personal friends of Cesar. Carlos said they would be very valuable to us because they carried with them the entire history of the union’s activities in the Pajaro Valley and could give us information that would otherwise take us years to discover. I agreed and said let’s get together with them. When we met a couple of days later, I learned some of these men and women had been working with Cesar since the 1950s when he was with the CSO (Community Service Organization). The Cobos family, Bernardo Carlon, the Mata family who were originally from Crystal City, Texas, Guadalupe Jauregui and his family, who were from the state of Jalisco in Mexico, Elias Fernandez, Pedro Gonzales, the Tomas Alejo family, who were from Donna, Texas and several others came to our first meeting and I could see that they not only knew the entire local history of the union, they also knew the people who were secret supporters of the union, and those who were not to be trusted. There was also a member of the Watsonville Organizing Committee named Bruce. I don’t remember his last name but he was an Anglo, around 25 years old and very out spoken. He knew the other members of the group but only in a casual sense and worked as a farm worker for one of the apple growers. What I would learn later about Bruce was that he was a member of a radical group based in Watsonville. Roberto, my supervisor in Salinas, was always cautioning me about not letting Bruce’s group exert too much influence on the decisions we made in Watsonville. Looking back, Bruce and a friend of his, Frank Bardacke, did provide valuable counsel to me during my time in Watsonville. As I mentioned previously, I had just graduated from college and was still very pollo. I knew I had to shed this “college boy mentality” and learn how to be more decisive. Bruce and his group were the ones who in the background and in private kept pushing me by providing valuable insight and analysis of what were some of the things I should be doing in Watsonville to organize farm workers. After strawberries, the other big crop in Watsonville was apples. Some time in July, the apple growers, about 30 of them, had quietly signed contracts with the Teamsters Union. There were no elections, no meetings of the farm workers, no one asked the farm workers if they wanted to be represented by the Teamsters. The Teamsters just went in there, met with the growers and had them sign three year contracts. The Teamster unit was called Local 1973 and was headed up by a man named David Castro. I don’t know who made the decision to launch the apple strike (Cesar, UFW board?) all I know is what Roberto told us. For the next hour we worked the telephone to let the organizing committee know that the apple strike was going to start today. We also got word to people who were Chavistas to the bone and would drop everything to come out to a UFW activity that today was going to be a big day. When Roberto and his group arrived from Salinas we were ready and waiting with car loads of people. Our target we were told was the William Buak Apple Company. He was one of the biggest apple growers and processers in the area and also one of the first to sign with the Teamsters. When we arrived at the apple orchards on Green Valley Road, we parked and immediately went in to talk to the workers. I would be remiss if I didn’t reveal that the UFW had “submarines” (UFW members and supporters) working undercover in all the farms and ranches in our area. They were the ones who supplied valuable information from the inside about the presence of Teamsters, what was being deducted from pay checks and what the working conditions were like. We even had maps of all the field operations and time estimates of which orchards would be picked and when. As we called the workers out on strike, it was clear that the submarine’s information was good because it wasn’t too difficult to pull the workers out. In no time more than 40 dropped their apple sacks and joined us on the edge of the road with a red union flag. We then went to other parts of the Buak farm and got other workers to come out on strike. I never saw Mr. Buak or his son Nick that day. By five in the afternoon we had a huge caravan and headed back to the Watsonville union hall with horns honking and flags waving. Once at the hall, we had a meeting where Roberto addressed the workers and explained the details of the Teamster contract (which they had never seen much less knew about). He told them why the strike was important in terms of sending a message to the Teamsters and growers that the days of treating people anyway they wanted to were now over. The strikers asked questions and signed union authorization cards. That afternoon we signed up 97 pickers. We ended the meeting by explaining the strike benefits, and what we would do if the Border Patrol showed up. The workers were then given rides back to where they were living. Some of them were living in housing owned by Buak so we went in the back way. The next day we had picket lines set up all over the Buak properties by 6:00am. We were loud and there was a lot of excitement in the air. I don’t know where they came from, but tacos appeared and there seemed to be enough to go around for everyone. Then, at 9:07am, the Immigration Service came rumbling down the road. They had two vans, one forty passenger bus and a station wagon. As they approached the picket line everybody sort of froze. We (the organizers) were not sure if the pickets would hold their ground. We had agreed the night before that if the Migra showed up, people should not run, just stand there like law abiding American citizens . . . and don’t say anything. As the Border Patrol slowly drove pass the picket line only a few people ran into the orchards, everyone else held fast. The Border Patrol drove on by and parked on the Buak property where the apple processing machines and warehouses were. They got off their vehicles and went looking for Mr. Buak. Mr. Buak who was standing right in front of us just lowered his head and kicked the dirt as he turned around cussing under his breath. (I mean, what was he going to do, tell Mr. Sill that all these strikers were his former workers?) Mr. Sill gazed out at the picket line for a second and then looked at us from head to toe and said, “Well you boys be careful. You never can tell what might happen way out here in the back roads.” Yes sir we said at the same time. Mr. Sill then walked over to Mr. Buak and mumbled something we couldn’t hear. Y otra vez, Mr. Buak kicked the dirt. With a simple hand signal, Mr. Sill’s people boarded their vehicles and turned around to leave. After they got down the road, our picket line let out a big cheer and I am sure for some of those strikers standing firm to Border Patrol would be a memory that they would carry with them for a long time. But just as the Border Patrol disappeared in the distance, here comes a caravan of brand new muscle cars with bright paint jobs. It was the Teamsters from Local 1973. There were 22 of them altogether including David Castro. They parked on the opposite side of us and immediately began shouting obscenities and insults. David Castro, headed off to the main office presumably to look for Mr. Buak. The Santa Cruz Sheriff’s Department which had been present since about seven in the morning moved in closer as the Teamsters became louder and more obnoxious. After a morning of insults it was getting close to lunch time and the Teamsters must have had reservations some where because almost on cue, they looked at their watches and left just as they came in. The apple strike was covered well in the local newspaper. The reporter who was assigned to the strike tried to be fair and to his credit, he did ask a lot of questions from all three sides. We did experience violence from the Teamsters though. Shortly after the strike had started, Pedro Gonzales, and Carlos Ruiz, went into a Buak orchard to talk to some new workers that Buak had brought in to scab. When they didn’t come back, we sent a bigger group to go find them. As it turned out, Carlos and Pedro had been attacked by the Teamsters and were on the ground and bleeding. We rushed them to the hospital. They had been beaten and Pedro’s arm was broken in two places. The strike continued into October and Buak had a lot of trouble getting his apples picked. At one point he complained in the local newspaper, (Register-Pajaroian) that the Teamsters Union was not giving him much support against the United Farm Workers strike in his orchards. “It’s been very strange,” Buak said, “I have gotten any help from the Teamsters in the field. I’ve had to shoulder the who thing myself.” We continued with the picket lines and the strike but them Mr. Buak got an injunction against us. Jerry Cohen did his best to fight it but the judge ruled against us. We now had to put a picket at 25 foot intervals. I remember Manuel Chavez came to visit us one day and check out how things were going. I also remember we had a big rally in downtown Watsonville and El Teatro Campesino came to perform. On October 9th, with the apple harvest winding down, Roberto Garcia decided it was time for us to declare victory and close it down. We had made our point, the Teamsters may have the contracts, but we have the workers. Jerry and the legal department went back to court to fight the way the judge in Santa Cruz had made the ruling during the strike. I believe it had to do with the way were served and the fact that the union was not given any prior notice before the judge made his decision. Anyway we lost again in court. The apple strike had ended but the farm workers and many of our supporters in Watsonville were still excited about the enthusiasm that had been generated by the strike. At a meeting in the union hall the Watsonville Organizing Committee asked Roberto for permission to begin local boycott activity and he said yes. They decided to take on the Gallo Wine boycott and went out and counted every store in Watsonville that carried Gallo wine. At a subsequent meeting it was decided which stores were the most vunerable. Initially we convinced 10 or 12 stores to go along with us. A couple of those stores only agreed to cover up the Gallo wine with butcher paper and said that if a customer wanted to reach in and buy the wine they could. We decided to go along with this “compromise.” But with the other stores in Watsonville (maybe 30 or 35), we decided to go a head and spend the winter months picketing them. We chose two or three stores at a time and rotated our picket lines. Most of this activity was late afternoon work (3PM to 9PM) I believe that over time, we were able to get another dozen or so stores to remove the Gallo wine after they saw the picket lines were driving away their customers. To make the evening picket lines more interesting on several occasions Candelario Borjas and I would drive to San Jose, California to the public library and check out UFW movies (Decision at Delano, Huelga and others). One of the local community social service agencies which was friendly to the union would let us borrow a movie projector and we show the movies on the walls of buildings next to where we were picketing. (We had a power inverter that allowed us to run the projector off a car battery) As a size of the crowd grew to watch the “outdoor movie,” it created a mass that probably intimidated regular shoppers from coming into the parking lot and thus we were able to cause creative headaches for the store managers. Sometimes we felt a little isolated in Watsonville but we did our best to participate in all the union activities that we could. (Chino Vasquez in Gilroy would often lend us his bus to make our trips to La Paz or Sacramento) I also know that when El Malcriado was delivered to us in Watsonville, we were thrilled to read about the activities of the other field offices and the news from La Paz. Almost without exception, the lobby area of our little office on Porter Dr. would go silent as 10 or 15 people sat around and read the newspaper from cover to cover. Of course we were always looking for our photos or stories in the paper but those were few and far between. Looking back I would say that even though we were on the margin of things at times in Watsonville, we were very proud that we were part of a larger movement that was going on around the state and for that matter around the country. One could sense in the farm workers who had come in from other places, that they knew the union was their best hope for a better tomorrow. And even those farm workers who stayed in Watsonville year around knew that some day the UFW would have contracts which they could work under. I want to share a “confession of sorts” about an incident that took place during the boycott in Watsonville. One day a wino named Joe staggered into the office. He was incoherent and without a doubt, andaba bien pedo. He said he was looking for somebody. After a minute or so, I decided that who ever he was looking for was not to be found in this office. I got him to leave by pointing to the door and telling him it was time to go. A few days later Joe came through the front door again. He was intoxicated and smelled bad. Again, in slurred speech, slightly off balance and reeking of wine, he informs me that he looking for someone. “¿A quien andas buscando?” I asked him. He looked at me cross eyed and flashes one of those dumb smiles a drunk will flash you every now and then. He says he is looking for . . . . .and then he stops. He looks down at the floor and then admits that he forgot the name of the person he was looking for. I was embarrassed because there are other people in the office we are working with. (In the Watsonville Field Office we also ran the service center) Again, I show Joe the door only this time with a little more force. I apologize to the people in the office and returned to helping them with the forms they had brought in. The third time this guy Joe shows his face at the office it is before noon and he was already drunk. This time there is no one else in the office besides us. I got mad and proceeded to cuss this guy and shove him out the front door. “Sal te de aquí hijo de su chingada madre.” Well, as I am cussing at Joe and pushing him out the front door it suddenly occurs to me to stop. I don’t know what hit me but I got a flash of my own. I said to myself, Joe is a wino, that’s a fact. That means he drinks wine. I then said to myself, Joe must have friends who also drink wine. I decided that maybe Joe was an asset. I brought him back to a chair and decided to talk to him, and find out who he was and where he lived. We didn’t get very far because he was drunk but I did make sure that he was welcome to come back when he wasn’t drinking. About two days later he showed up and he wasn’t drunk. There were some tacos in the office and I offered him one. We talked and I learned that he lived in the back of someone’s house. He worked once in a while and yes he liked to drink wine. I also learned he knew all the other winos in town. When I asked him what kind of why he drank he stared naming all the Gallo brands. So it occurred to me, what if Joe could convince his friends not to buy Gallo wines? What if Joe was successful? Certainly that would be a contribution to the boycott. A couple of members of the Watsonville Organizing Committee volunteered to work with Joe. Pedro Gonzales, Elias Fernandez and others went with Joe to visit his buddies and explain to them what the UFW was doing with the Gallo wine company. They also explained why it was important. Pedro told me later that he had asked Joe and his friends where they threw their empty wine bottles. They showed him a spot and it full of the Gallo brands. I don’t recall all of the details of what the committee told Joe and his buddies, but I do know that Joe would still show up from time to time drunk as hell and I would “politely” let him sit and rest a while. The reason I stopped cussing at him and chasing him out of the office was because Pedro was reporting back that his periodical checks of the spots where the winos threw their bottles now contained piles of the other brands. And our checks of the stores that continued to sell wine revealed that the Gallo brand wasn’t moving as fast as it used to. Again, I don’t know what Pedro and the others told Joe and his friends, but I do know that the winos in Watsonville played a role in the United Farm Workers Union of America boycott against Gallo. I think it was in December 1974 when I found myself in a meeting at the UFW law office in Salinas, California. There were about 15 people cramped into the law office library. Among those present were Cesar Chavez, Jerry Cohen, Fred Ross, Jr and a host of farm workers. Fred was sharing his plans for the March to Modesto that was going to take place in February. Basically we were going to start in San Francisco with a rally and then march the 110 miles to Modesto to bring attention to the Gallo Wine boycott. The meeting went on and details were discussed, but what I remember the most about this meeting was the farm worker who was sitting at the end of the table who lit up a cigarette. Those of us who were staffers immediately looked around and at each other because we knew that Cesar did not like cigarette smoke. So the question became, who was going to tell this farm worker to put out his cigarette. As we continued to scan the room to see who this farm worker had come with, Cesar finally spoke up and said very politely, “Compañero, no se permite fumar en este edificio.” (There is no smoking was allowed in the building.) When the farm worker realized that he was the only one with a lit cigarette, he quickly put it out. What he didn’t know was that there was not a “no smoking” rule for the building. The no smoking rule was Cesar’s rule. Throughout the month of January we constantly brought up the March to Modesto among our members and supporters in Watsonville. We had what were called Junta Generales where we discussed the news and issues we were involved with in the Pajaro Valley. As the start date for the Modesto march drew closer we had probably 100 people who had made arrangements to participate. The day of the march we drove in a car caravan to San Francisco and joined with the two or three hundred others who were already gathered and after a couple of speeches, we began the trek to Modesto. I didn’t walk the entire 110 miles myself as I was transporting people back and forth between Watsonville and the march. But I did make the last two days and was part of the contingent that made its way into Modesto. Crowd estimates were as high as 20,000 farm workers and supporters and I know Fred Ross, Jr. was very pleased with the turnout. As we would learn later, this march to Modesto gave notice to the growers that UFW was far from dead and with a new governor in office, they could expect to hear more from us in the not too distant future. Despite her age and the need to work, Maria was always willing to participate in union activities and take off from work. On more than one occasion she would take off from work and go with us to meetings. She went with us to Modesto and she joined us for at least 3 of the five Mondays in May of 1975 when we went to Sacramento to lobby for the ALRA law. Maria was a Chavista to the max! Those tears that Maria brought into the office that day always served to remind Carlos and I that the five dollars a week we were paid by the union was far too much compensation for what we were learning about the spirit of people who believed that one day their time to stand up would come. When Carlos and I were out and about in town or in the fields, we always made it a point to look for the faces with the tears, because if we could find the tears, we would find another Maria. Some time in March of 1975, I took a group of farm workers to the University of California at Santa Cruz. Dolores Huerta was scheduled to speak at an event and we wanted to show our support. The crowd she addresses was maybe two hundred strong and after the talk she asked to stay for a private meeting. She thanked everyone for coming over and shared with us what was coming in the next few months with the new law the union was trying to get passed in Sacramento. She told us that that there would be a lot of actions and to be ready to move on a moments notice. She said 1975 was going to be a very important year. I really didn’t see much of Dolores after that but she was right, 1975, was going to prove to be a very busy year. Jerry Brown had been elected governor of California in the fall of 1974. He took office in January of 1975 and the union made its move to get legislation passed that would allow farm workers to vote in union elections. The history of how all of this went down has been written about so I won’t go into the details of what became the Agricultural Labor Relations Act, but I will share a couple of personal stories that I have never told before. In late April of 1975, I was told by my supervisor in Salinas, Roberto Garcia, to make preparations to take as many farm workers as possible to Sacramento every Monday in May. He said Cesar wanted thousands of farm workers all over the capitol building to lobby legislators and to show support for the new farm worker law that was being debated by the legislature. We called a junta general (general meeting) at our union hall and got our regular crowd of 200 plus people. We shared with everyone the plans for May and discussed logistics. The union had a gasoline account at a local service station and we offered to pay for fuel if people would use their vehicles. Every Monday at 4:00am we met at the union hall in Watsonville did a quick check in and took off for Sacramento. The first Monday went well even though our turnout wasn’t that large. When we went on the second Monday, there were a whole lot more people. One of the farm workers who had been riding with me was an older man. I would say he was close to 70 years in age. After I parked my car by the Capitol and we got out he showed me a surprise under his shirt. He said, “Mira lo que traje por si acaso hay problemas.” When I looked over at him, he had pulled up his shirt and showed me a gun. Stunned, I stepped toward him and whispered that we couldn’t bring guns with us into the Capitol. He looked disappointed but his disappointment was far less than mine if Cesar ever found out we had brought guns into the State Capitol of California. I opened the trunk of my car and motioned for him place the weapon behind the spare tire. By the third Monday of May, the Teamsters Union had finally realized they were losing the public relations and media coverage war regarding the pending farm worker legislation. They brought in farm workers from the Fresno and Bakersfield but their group was disorganized and they really didn’t know how to go from office to office looking for state legislators. They also didn’t have any signs to speak of and the ones they did have were puny ones with small letters that no one could read from a distance. On the fourth Monday the Teamsters surprised us. They finally figured out how to rent charter busses and brought in somewhere between two and four thousand farm workers. They also figured out how to make signs. But we had had them beat. Our side was now topping 6,000 farm workers and supporters. As both our groups roamed the Capitol, there were “encounters” in the restrooms and in the hallways. The Teamsters were still in their bullying mode and tried to pick fights even in front of all the cameras. After our afternoon rally on the West side of the Capitol, our people took a break and had impromptu picnics on the grassy areas around the Capitol. I went inside to look for Roberto and tell him we were going to go back to Watsonville. I thought he might be in Assemblyman Richard Alatorre’s office so I headed in that direction. When I found Roberto, I also found some of the other union organizers who had come up from around the state including Pablo Espinoza, from the Arvin area, Tanis Ybarra, from Fresno, Al Rojas, Juan Huerta from King City and others. Jerry Cohen and a couple of the other UFW attorneys were also in Alatorre’s office sitting on the floor talking. I spoke with Roberto, bid good-bye to the others and headed down the hall to the West side of the Capitol. When I stepped out the door I saw about two hundred of our members with their red, white and black flags pinned against one side of the Capitol and about 500 Teamsters attacking them with oranges, tomatoes and other objects. I did not see any police in sight. I immediately ran back to Alatorre’s office and burst open the door. I was out of breath and yelled, “Trouble, the Teamsters!” Everyone jumped to their feet as I related the details of what I had seen. We all ran back down the hallway to the Westside of the Capitol. I had never seen Jerry Cohen run that fast. By this time the police had been altered that there was a disturbance on the Westside of the Capitol. When I got to the doors Jerry was yelling at a police officer to bring in back up support. I stepped outside and began moving toward the farm workers when I caught sight of an orange coming my way. It was too late for me to get out of the way and I got hit real close to “my control center,” si me entiendes como. I didn’t fall down, but I did have to pause and let the pain go away. The Capitol police were rounding the corner and the Teamsters began their retreat. When things settled down you could see the ground was littered with oranges, tomatoes and other fruit. Aside from bruises and tomato splats, there were no serious injuries. Once again we could see the Teamsters were about intimidation and violence. After Governor Brown signed the Agricultural Labor Relations Act, the union began preparations for what would be an intense campaign to educate farm workers about how the election process was going to work. One of the first things that I remember was that Cesar had all the boycotters to come back to California. This included board members. Marshall Ganz, Eliseo Medina. I only knew about Marshall from what I had read in the books about farm workers. Also coming to California were Artie Rodriguez and a young lady named Liza Hirsch who were assigned to the Salinas office. Marshall took over Roberto Garcia’s spot as the top guy in Salinas and pretty soon we were having meetings all the time as he started laying out battle plans. A few weeks later all the organizers were ordered to report to the union headquarters in La Paz. We were told we would be there for a week of training. Counting all the organizers and others who had come to La Paz, there must have been over a hundred people at the training. Fred Ross Sr., the man who “found” Cesar back in the 1950s, was brought in to do the training and video cameras were set up to let us see how we did our house meeting pitch. There was much excitement among everyone present. We knew this was an historic opportunity to show that the United Farm Workers of America was the union of the farm workers. After we returned to our respective areas we began executing our campaign plans. We organized house meetings, and distributed flyers that were shipped in weekly from La Paz. In my rush to keep up with all the new duties and responsibilities I made a huge mistake. When I got back from the training in La Paz, I did not call a meeting of the Watsonville Organizing Committee. I did not tell them formally that the union was dissolving the existing structures at the local level while we were going to be in campaign mode. My failure to hold a meeting cost the friendship and support of Guadalupe Juaregui and a couple of others on the committee as they felt I had slighted them. I was very embarrassed at having lost the respect from Mr. Juaregui because he was one of the committeemen whose wisdom I valued the most. To this day I carry the memory of that failure to communicate with and am very conscious about not letting that mistake every happen again. Throughout the summer, Carlos, Jose and others who had come to Salinas and Watsonville to prepare for the elections spent day and night visiting workers in the fields, in the labor camps, at churches and in grocery store parking lots. We had to built trust and leads at ranches where we had never worked before. Some of the crops where we were organizing included: lettuce, broccoli, celery, radishes, cauliflower, and apples. Although the new ALRA law allowed for union organizers to talk to workers in the field, we were often chased out by the foremen or the owners themselves. Sometimes we would to a field to talk to workers and we would see the Teamsters in the field already talking to them. When we went in the foreman would tell us that the time to talk to the workers was already over. I remember we got chased out of West Coast Farms, Crosetti, Sakata Farms, and a lot of other places. On August 28th, the United Farm Workers Union filed its first petitions for elections. We had collected the necessary signatures at selected ranches and when the Agricultural Labor Relations offices opened their doors at 8:00am in Salinas, we were there with a crowd of about 300 people. Throughout the whole month of September we were non-stop in our filings for elections. I had worked several ranches in particular and was very anxious to know the results. But it didn’t take long for the growers and the Teamsters to get some ruling that impounded the counting of the votes. I remember one radish farm in particular, Frank Cappurro and Sons in Moss Landing, California. The workers from Cappurro had come to the office in Watsonville asking for the union to represent them. Getting them to sign the authorizations cards was easy. I made several visits to the homes of the workers to explain how the union work and what the benefits of union representation were. On the day of the scheduled vote, the Teamsters had managed to get on the ballot. Still, I felt confident that we were going to win this ranch. When the ballots finally got counted some time later, the workers ended up voting for “no union.” Then, two months later, they showed up at the union office in Watsonville again to ask for our help because the foremen were treating them badly and several had gotten fired. We had to tell them that under the new law, we couldn’t do anything until after a certain time period had passed. I believe it was late September or early Octobers when the legal arguments got settled and the ballots from all the elections were going to be counted. It took place at a hotel in Salinas and a huge crowd showed up to find out how the voting went. The ball room was packed with reporters and others had been waiting a long time for this moment. It was night time and I remember I was standing outside the ballroom behind a door with Carlos Ruiz that gave an up close view of the ALRB agents who were counting the ballots out loud. We were peeking through a crack and good see everything. When I turned around to cough, I saw Cesar standing with us also peeking in behind the door. When the counting was over there were some surprises and disappointments. But over all it looked very good for us. The early part of 1976, had us again running around looking for farm workers to sign legal documents. The excitement of 1975 had gone away and now I was like a gopher as in go get this and go get that. One day a friend of mine from El Teatro Campesino in San Juan Bautista came over to the house. (Smiley Rojas) After we drank a half a bottle of wine he said the teatro was going on tour all over the United States and needed some more actors. Smiley and I had worked together before when I was in college and participating in teatro. He asked me if I would go with them. I said I would have to think about it. I was living with my girlfriend at the time and needed to discuss it with her. A week later I decided to join El Teatro Campesino as a guest actor. I resigned my appointment as a union organizer and left in April for a trip around the country presenting the play “El Fin del Mundo.” We did shows in El Paso, San Angelo, Austin and San Antonio, Texas. Then we headed north to Kansas, Ohio, Ann Arbor, Michigan, Chicago, Madison, Wisconsin, and Minnesota. When we came back in May, I needed to go to work so I went to the union office in Watsonville and got a dispatch to go work in the strawberries. When the farm workers saw me picking with them they were shocked. I said, “el trabajo es trabajo”. I worked under union contract for about a month and then was offered a job working in the lettuce. I took the lettuce job because it paid more money. To be sure there are many more stories related to my time working with the United Farm Workers of America. But I end now reflecting on the many friends I made during my seven years in California. I have tried to stay in touch with many of them but I don’t get out to California that much anymore. I did attend the 25th Anniversary of the Union in 1987 in Delano and hope to attend the 50th Anniversary in May of 2012. To be sure, it has been a long road and I am very proud to have been a part of the farm worker’s movement.